Panama became known to European navigators in the early years of the Great Geographical Discoveries. The first European to set foot in what is today Panama was Rodrigo de Bastidas in 1501, five years after Christopher Columbus set foot on the coast of the Dominican Republic. When Bastidas arrived at Panama, here still lived only a small number of indigenous people. Initially Panama was under the rule of Spain. In 1821st it received independence, but not as a separate country but as part of Greater Colombia. The country gained full independence in 1903rd. The best time to visit Panama is the period from December to March. In this part of the year the weather conditions are most favorable. In Panama you need only light summer clothing. The more light and airy, the more comfortable you will feel. Bring your slippers, beach accessories, sunscreen and a pair of sturdy, comfortable shoes in case you want to walk into the wild. Do not forget to buy a repellent that will protect you from mosquitoes! Outside the settlements these small insects can become a real scourge. Bring in any case an umbrella because it rains a lot here. What not to miss while in Panama? Surely you should see the Panama Canal, which is the biggest attraction in the country. The capital of Panama, with its skyscrapers, shops, restaurants and exciting nightlife is one of the most exiting places in the country. This is probably the city with the most skyscrapers in Central America. While in Panama City do not miss the bridge of the Americas, which connects North and South America. If you’re a lover of the beautiful nature, you must visit at least one of all the 14 national parks. We recommend Coiba National Park, which is under the auspices of UNESCO as a world heritage site. Speaking about beautiful places amidst the sea, we have to note also the islands of San Blas, located not far from the northern coast of the country, Boca del Toros, and the Pacific Islands Las Perlas. All of them have to present into the route of the experienced travelers. One of the biggest attractions is the volcano Baru, whose slopes are covered with an amazing rain forest. What to eat while in Panama? Panama will literally astound you with its amazing variety of fruits and vegetables. Panama’s warm and humid climate favors the cultivation of more fruit than you ever imagined existed. In the country are also consumed a great number of cereals, maize and maize products, as well as any kind of meat or dairy products. Panama’s cuisine is a unique combination of Spanish, African, Caribbean and Native American culinary traditions. Panama’s meals are not characterized by specific method of preparation, but rather with an unprecedented diversity. Be sure to try empanadas. These are kind of buns that are stuffed with meat, cheese or vegetables. It is usually made from corn flour and fried. It is recommended to try also local tortilla. This is a type of popular dish in the region of Latin American and Spain. It is usually prepared with potatoes, eggs, cheese and is quite tasty. If you wish to enjoy the best local meals during your culinary tour in Panama, you have to taste the great guacho. This is a kind of dish made from fish or chicken. In Panama they add to the guacho a lot of rice. The guacho is usually seasoned with a little milk and with plenty of tomatoes, garlic and onion to get a stronger flavor. Do not miss also to taste the traditional of Panama fish that is prepared in banana leaves and served with a side of rice and beans. In this country you can try a huge variety of fruit juices and cocktails from exotic and fresh tropical fruits in excellent prices. Finally, if you like sweets the best choice is Tres Leches. This cake is something that must be ordered at any cost. It is covered with cream and for its preparation are used three different types of milk. Most visitors describe it as one of the most delicious desserts they have ever tasted. Like most countries in Central America, Panama is also considered relatively dangerous destination. The capital Panama City and the other major cities are no exception. However, there are places that are relatively safe. When already in the country, it is advisable to ask the nearest tourist information center about which locations and areas are to be avoided. They will give you detailed information about your personal safety. Since most of Panama is covered by tropical jungle, in this part of the world are wide spread a large number of diseases that most Europeans and Americans have not even heard about. It will be very good if you visit your GP before traveling and talk to him what to do to protect yourself from diseases like malaria, dengue (a type of acute fever), yellow fever, Japanese encephalitis and other diseases. The majority of dangerous diseases are carried and spread by mosquitoes. Panama has hundreds of stunning beaches, but the most beautiful are located on the coastal islands. The province of Bocas del Toro and the archipelago with the same name, located in northwestern Panama is a real tropical paradise with white sandy beaches, transparent sea, coral reefs and countless coconut trees. The islands of San Blas are no less beautiful. Their beaches can boast typical Caribbean beauty with palm trees and bright sand. The islands are surrounded by sparkling coral lagoons. Among the waters of the Pacific are situated the Las Perlas Islands. They are covered with dense rainforest, and their shores are truly fascinating. However, it is no necessary to go to one of the archipelagos if you wish to find beautiful beaches, suitable for families. You can find them all along the country, whether you’re on the Pacific or along the Caribbean coast. Panama falls into the subequatorial climate zone. The weather over the country is hot and humid throughout the year. The temperatures range between 29°C in October, the coldest month of the year, to about 32 – 33°C in March. In Panama there is no winter or summer, but there are two distinct seasons – dry and rainy. The rainy season is longer. It usually lasts about 8 months, from April to November. In this part of the year over the country could fall more than 300 mm of rain within a month. The dry season coincides with winter in the northern hemisphere. It is very sunny, the temperatures are slightly higher, but rains are still not excluded. Panama is a country in the geographical and historical region of Central America. It occupies the isthmus that connects the continents of North and South America, and is the southernmost part of the North American continent. It falls between 9 degrees and 37 minutes and 7 degrees and 12 minutes north of the equator. The country shares borders with Costa Rica to the west and Colombia to the east. Panama borders also the Caribbean Sea to the north and the Pacific to the south. It occupies an area of 75 517 sq km. In its narrowest part the country is only about 60 km wide. 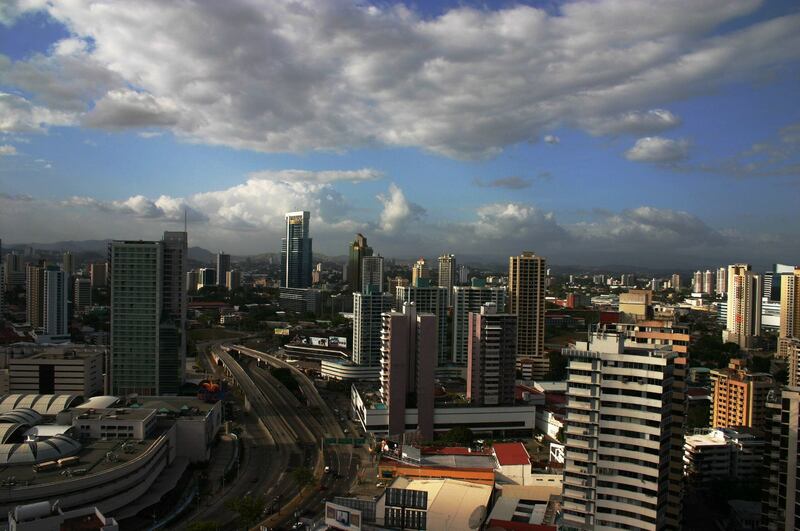 Panama may be described as one of the countries with the most strategic location on the planet. The Panama Canal, which shortens the route between the Atlantic and Pacific with thousands of kilometers, passes through the central parts of the country. The nature of Panama is amazing. Almost the entire country is covered with dense rainforests. Panama’s jungle is one of the places with the richest diversity of flora and fauna in the world. The reason is largely rooted in the strategic location of the country between the two continents. Here, amidst the dense hydrophilic vegetation are found such animals as jaguar, puma, ocelot, capybara, sloth, various poisonous tree frogs, and amazing variety of birds. Here, among the branches of tall trees, can be seen the most powerful and dangerous bird that lives today on our planet, the Harpy Eagle. In many rivers and lakes in Panama are found crocodiles. The country is home to a wide variety of freshwater and ocean fish species. Approximately one third of the total area of Panama is declared protected area and falls within the borders of various national parks and reserves. The landscape of Panama is diverse. Mountains occupy about 1/2 of the country, and most of them are located in North America, west of the Panama Canal. The highest point in Panama is located in the western parts of the country. This is the Volcano Baru, whose height reaches 3475 m.
The mountains, which pass through the territory of Panama, are part of the Cordillera mountain range, which can be traced along the Pacific coast all the way to Alaska. The coastline of Panama is also diverse and highly indented. Along the Caribbean and Pacific coast can be seen hundreds of large and small peninsulas, bays and islands. The combination of high mountains and heavy rainfalls suggests the incredible water resources of this country. Chagres is the largest river that flows through the territory of Panama. It is located in the central parts of the country and flows into the Caribbean Sea. Gatun is the largest lake in Panama. This man-made lake plays an important role of transport corridor between the Caribbean Sea and the Pacific Ocean. In fact, this is the main reason for its construction. The lake is filled mainly by the waters of the large Chagres River. The population of Panama is approximately 3.5 million people. Similar to the other Central American countries, Panama’s population is of varied ethnic origin. It consists of Europeans (mainly descendants of Spanish settlers), indigenous, dark skinned and mixed people. The mixed-race population is the largest share of the total number of local residents. The most numerous are mestizo, followed by mulatto. Two out of three residents are of mixed origin. Official religion in Panama is Christianity. The majority of the population consists of Roman Catholics. Panama’s population is unevenly distributed in the country. Around 1.2 million of all the residents live in the metropolitan area of the capital Panama City. Panama has a developing economy, but is significantly more stable and developed than many other Latin American countries. There are two official currencies – Panamanian Balboa (PAB) and USD. A characteristic feature of the local economy is its strong connection with the services sector. The main source of income for Panama is the Panama Canal. In 2008 the annual ship traffic reached 14 702 vessels, which means a huge amount of money for the local economy. Year’s revenues from the Panama Canal for 2008 amount to about 2.007 billion dollars. Besides the Panama Canal, the country still relies on its financial sector and well-developed tourism industry. The main reasons why tourists choose to visit Panama are its beautiful beaches, year-round warm climate and forest wealth. Agriculture is also very important in the formation of GDP. Here are grown coffee, cocoa, tropical fruits (bananas, kiwi, pineapple, guava, mango, papaya and many others), vegetables (tomatoes, peppers, chili – peppers, potatoes, etc. ), cereals (rice, corn) and beans.